If you’re lucky enough to live by the water, then you’re (un) lucky enough to understand the challenges of maintaining a pristine property – free from erosion, warping and other natural issues caused by mother nature. Salty, humid air seemingly forces it’s way into every crevice…of everything. Wood floors are to be included under this umbrella category — in reality they are at the top of the list. As a result, homeowners unknowingly drive themselves mad practicing redundant tasks in hopes to erase all traces the humidity left behind. As a specialized luxury wide plank flooring company – the driving force is passion. Our craftsmen believe in taking preventative measures to produce a quality product that will last you a lifetime. Homeowners who reside by the ocean should be no exception to this philosophy. As we see fitting, we will recommend specific flooring to our clients. 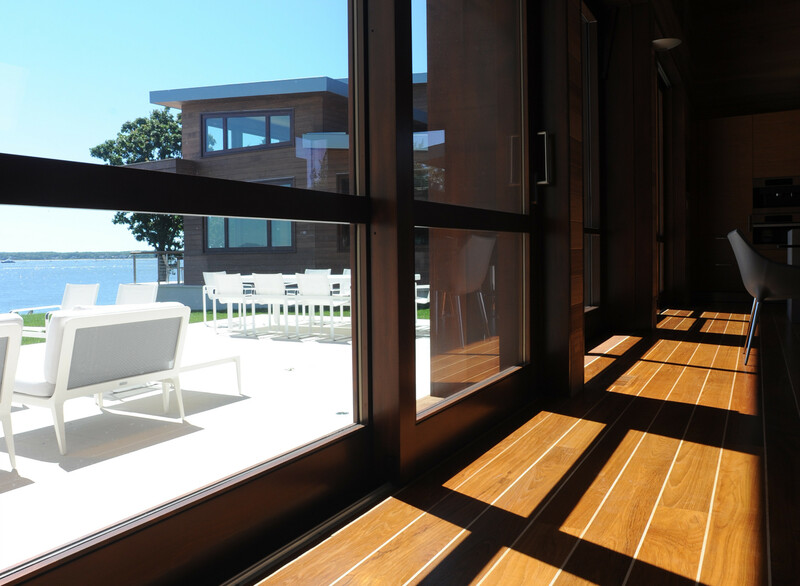 Nearly all of the projects we come across will benefit from engineered planks, especially those immersed in humidity. The process that which solid wood goes through to become engineered planks makes it considerably stronger than untouched ‘solid’ wood. Below we will let you in on our process and the different steps we take to produce the longest widest, most reliable planks in the industry. Firstly, our wood is sourced from the best sustainable forests which happen to be from all over the world. Our lumber is hand-selected by us personally which enables us to have the most control over the quality of our planks. A thick 5mm wear layer of wood of your choice is adhered to our 11-ply Baltic Birch plywood. The contrasting perpendicular layers of this plywood strengthen the plank’s core and transform it into a reliable product. Because of this added stability, little to no warping will take place even in the most strenuous conditions. Using a glue-down method, our experienced craftsmen carefully install planks one at a time. They are locked into place with a tongue-and-groove feature. Once dry, the glue adds another ‘moisture-barrier’ to your floor; it adheres to the bottom on the plank and the top of the subflooring ultimately creating an unbreakable bond. Natural oils are used to finish your floors. They are left both looking and feeling magnificent. You won’t have to worry about harsh chemicals and smells during the finishing process. An added benefit of using oils to finish your floor is that they penetrate the wood’s surface and work from the inside out adding yet another moisture barrier to the finished floor. At Woodwrights we specialize in custom engineered flooring and always make it our priority mill the widest and longest and strongest planks in the industry. We refuse to let the engineering processes limit our production capabilities and consistently look for solutions to push those limits. We believe in engineered wood flooring and take pride in every plank we produce. If you live anywhere near the water and plan of having your floors for a lifetime, Woodwrights Wide Plank Engineered Flooring is the only way to go.